Hastings United are about to embark on a hectic two-month schedule which could have a significent bearing on the football club’s season. The U’s have six Ryman Football League Division One South matches scheduled for December and nine more for January as they play catch-up with their fixtures. United have played at least three fewer games than every other team in the division and eight less than Ramsgate. Things haven’t been helped by last weekend’s scheduled trip to Molesey being postponed due to the opposition’s involvement in the FA Trophy and Tuesday night’s visit from Corinthian-Casuals also being called-off due to Casuals having a Trophy replay after a weekend draw. United should at least therefore be refreshed and raring to go when they play their first match for 11 days away to Herne Bay today (Saturday). It’s going to be a tough time, but I think we’re more than capable. The sides have already met a couple of times this term in the FA Cup. United eventually won 3-2 in a replay at The Pilot Field after a 1-1 draw in the first meeting, although Herne Bay had three players sent-off across the two games. The Kent outfit is up to seventh in the league - with games in hand on all of the teams above - having picked up 16 points from a possible 18 and kept five consecutive clean sheets in the league. United are in 14th place despite winning six of their last seven in the league, and are only eight points behind fifth-placed Faversham Town having played seven fewer matches. There’s encouraging news for United on the injury front. Sam Cole played a full part in training on Tuesday night and assuming he had no reaction afterwards, is likely to be part of the squad today. Zac Attwood also trained on Tuesday and was hoping to get some game time with the under-21s the following night. Jack Walder has one more match to run on his suspension and will be available again for the Parafix Sussex Senior Challenge Cup third round tie away to Worthing next Tuesday night. Ryman League, Division 1 South: Herne Bay v Hastings Utd. Macron Store Southern Combination League, Division 1: Haywards Heath Town v Bexhill Utd. Division 2 (2): Ifield Galaxy v Westfield. Reserve Section Challenge Cup, 2nd round (1.30): Westfield v Mile Oak. Sussex Intermediate Challenge Cup, 3rd round (1.30): Bosham v Bexhill Utd U21. Sussex Bluefin Junior Cup, 3rd round (1.30): Burwash v Eastbourne Rangers; Catsfield v Wadhurst Utd; Hooe Sports v West Hoathly; Peche Hill Select II v Billingshurst III; Racing King & Queen v Crowhurst; Ticehurst v Worthing Borough; Upper Beeding II v Old Hastonians. Macron East Sussex League (2), Premier Division: Hawkhurst Utd v Battle Baptists; Mountfield Utd v Robertsbridge Utd; Ore Athletic v Hollington Utd; Rock-a-Nore v Peche Hill Select; Sedlescombe Rangers v St Leonards Social. Division 1: AFC Hastings v Sidley Utd. Division 2: Herstmonceux v Icklesham Casuals; Little Common III v Hastings Rangers. Division 3: Mayfield v Herstmonceux II; West Hill Utd v Sedlescombe Rangers II. Division 4: Battle Baptists II v Wittersham II; Bexhill Rovers v Punnetts Town; Victoria Baptists v Bexhill AAC II. Division 5: Hampden Park Utd v St Leonards; Icklesham Casuals II v Sandhurst; Parkfield v FC Westridge; Sedlescombe Rangers III v Magham Down. 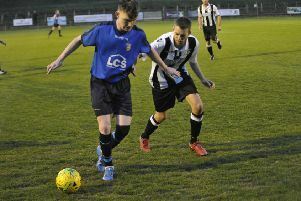 Wisdens Sports Challenge Cup quarter-finals (1.30): Bexhill AAC v Orington; Bexhill Utd II v Westfield III; Northiam 75 v St Leonards Social II. Eastbourne Coach Finishers Challenge Cup quarter-final (1.30): The JC Tackleway II v Grasshoppers Old Boys. Robertsbridge Charity Junior Cup, 2nd round (1.30): Peasmarsh Utd v Robertsbridge Utd II.